Located on the entry level of The Oberoi, Dubai, Ananta is an intimate restaurant serving refined Indian cuisine inspired by the country’s twenty-nine states. Open for both lunch (12.30pm till 3pm) and dinner (7pm till 11.30pm) daily, Ananta sets a sophisticated yet relaxed scene, with beautiful crimson furnishings and crisp white table linens. A glass, see-through show kitchen sits centre stage in the restaurant, allowing diners to watch on as food is prepared in front from traditional, coal-fired clay ovens. We’re here to sample the newly introduced ‘Tiffins of India’ lunch menu – something, I’d not heard of before my visit to Ananta. 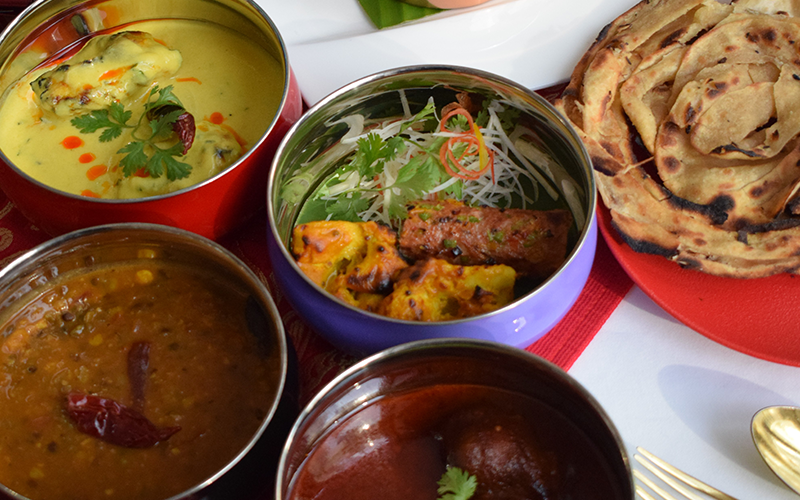 We’re told that tiffin boxes are hugely popular in India – they’re a type of lunchbox made up of three to four compartments that clip on top of one another to seal in homecooked food, then are carried around to enjoy throughout the day. Available now at Ananta during lunch time (to eat in), the nostalgic tiffins meal is served in under 30 minutes and is available with or without meat. With four boxes to explore, expect one starter, two types of curry, and a dessert – with a side of rice, or naan bread. While the menu promises to change weekly to showcase cuisines such as Punjabi, Hyderabadi, Awadhi and Rajasthani, dishes we enjoyed include Rajasthani laal boti (lamb cubes flavoured with royal cumin, chilli and yogurt, finished in the tandoor), murgh soweta tikka (chicken tikka flavoured with ginger, turmeric and coriander roots), and the lal mass (young lamb cooked with mathania chillies and smoked with clove). To finish, we had a sweet serving of jodhpuri malpua (saffron flavoured Indian thin pancakes with pistachio nuts). Friendly and warm, the front of house team did a great job of telling the traditional tiffins tale, which really brought the experience to life. The bottom line: The place to go for a generous, flavoursome lunch in elegant surroundings. Ideal for a business lunch with colleagues or an indulgent lunch with your partner. Details: Both the vegetarian and non-vegetarian tiffins menus are priced at AED 95 per person. To make a reservation, call 04-4441444 or see oberoidubai.com.